Some restaurants have been around forever. And Golden Phoenix at Equatorial is one of them. 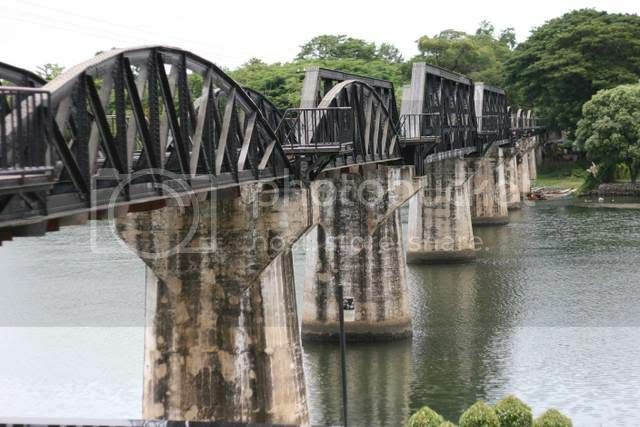 For those who love strolling down memory lane, you better stroll quickly, for the whole hotel will be closing it's doors at the end of March, to be torn down and rebuilt. While the Phoenix may rise from the ashes, it will be at least another 3 years before you can tantalize your palate with its offerings. Gasp, I will be close to half a century by the time the new Equatorial is ready. 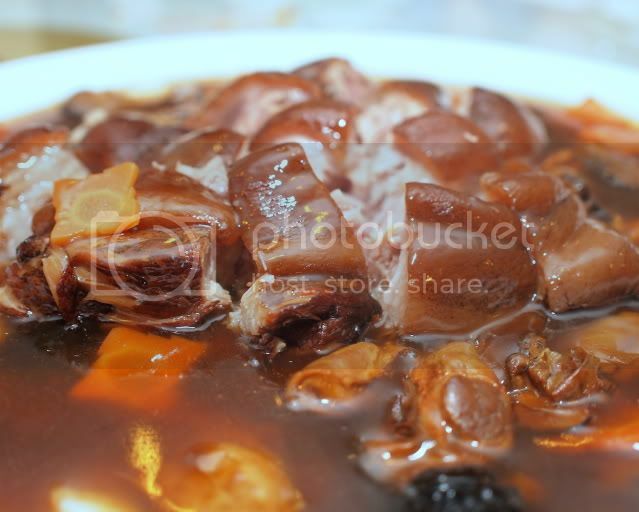 But despair not, while the Dragon may herald the end of the Phoenix in its current form, there is still one last hurrah, and Chef Ng Chee Wah has put together traditional menus for the coming Chinese New Year. I loved the tidbits of deep fried anchovies ( I think that's what it was), tossed in a fruit compote. 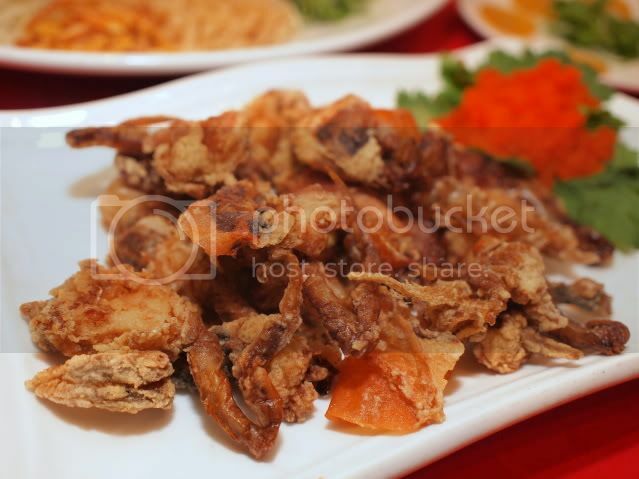 The signature Golden Prosperity Yee Sang, is different in that it has soft shell crab. 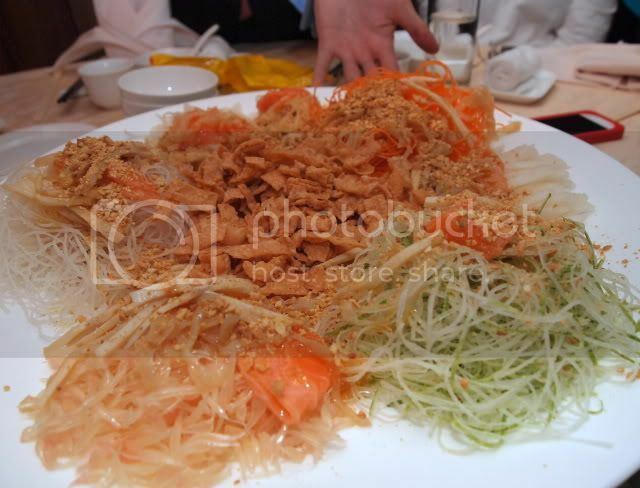 Actually, judging by the number of times one partakes in Yee Sang during the season, it's a good thing that various restaurants have different takes on this dish, offering a nice variety. 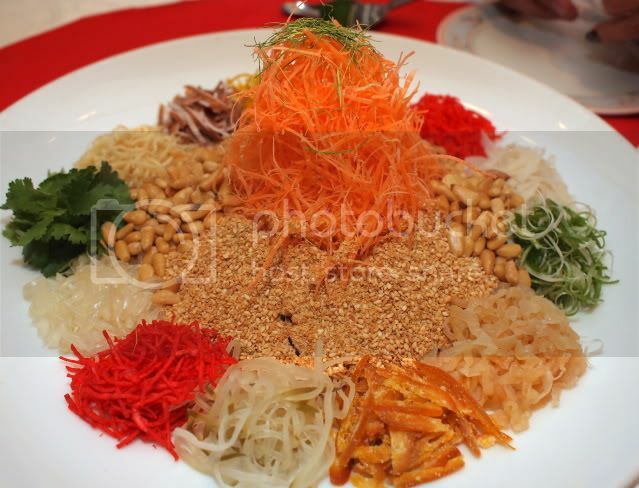 Adorned with pine nuts, and their specialty chinese coin carved out of oranges, together with the special plum sauce, the Yee Sang is a lovely combination. 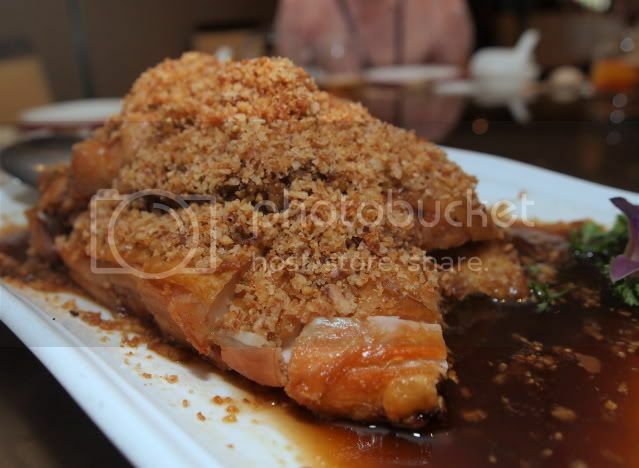 Traditional choices of salmon, jellyfish and abalone are also available till 6th February, for lunch and dinner, with prices starting from RM58++. 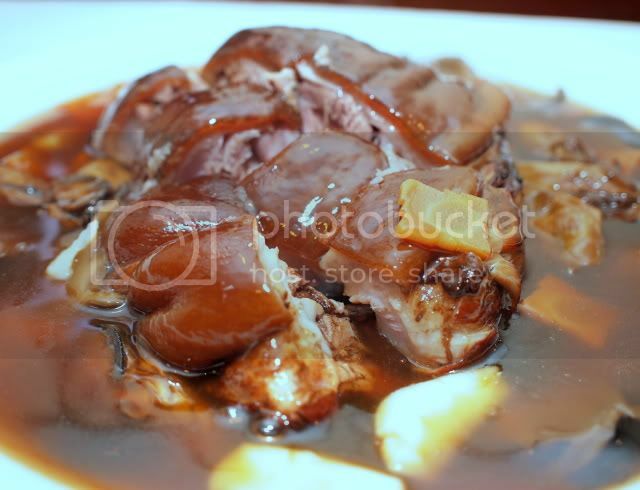 Roasted Chicken With Onions. Yes, there is a chicken underneath that rubble of onions. The onions are actually the highlight of this dish, aromatic, crispy, and imparting that glorious flavour to the simple chicken. 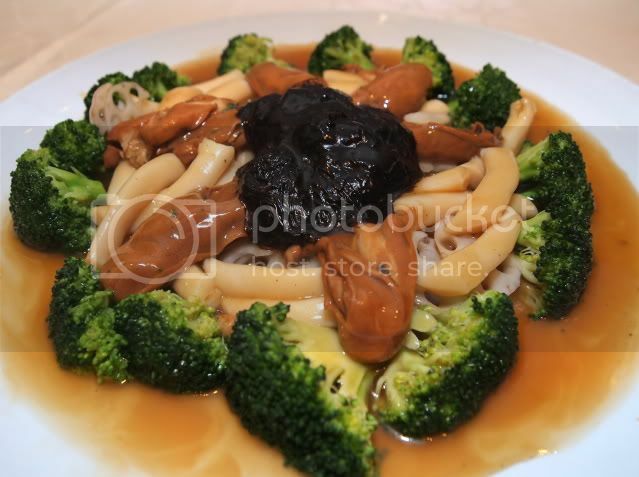 Braised Sea Asparagus, Black Moss with Lotus Root and Broccolli. When I was growing up, (as opposed to growing sideways), I don't recall ever eating sea asparagus. I wonder if it's a recent discovery. Oh, this is what the naked chicken looks like without the onion make up. 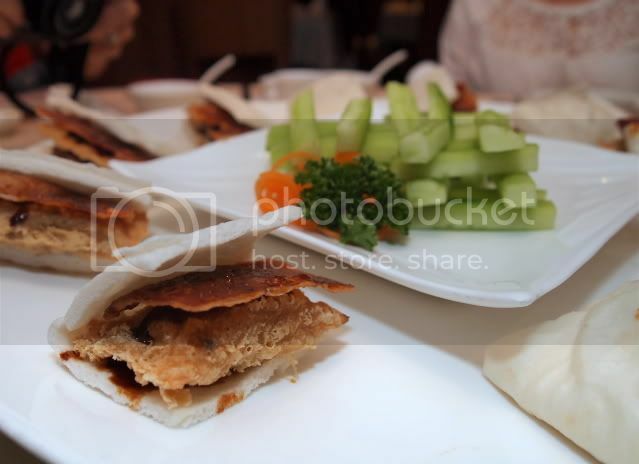 As the original dish was so overwhelmed by the onions, the professional photographers on the table requested another one without the garnishing. 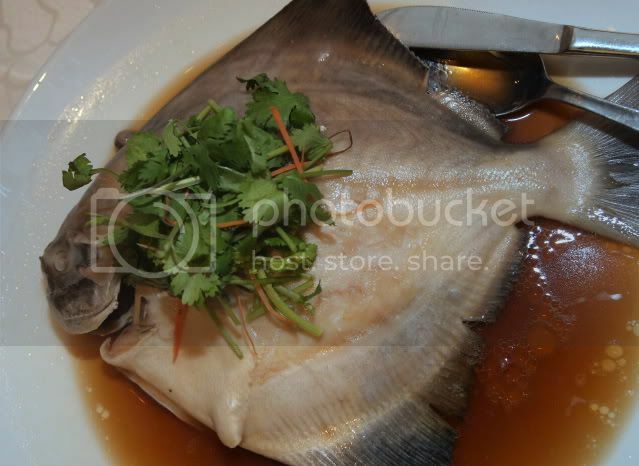 Steamed Pomfret With Soya Sauce. 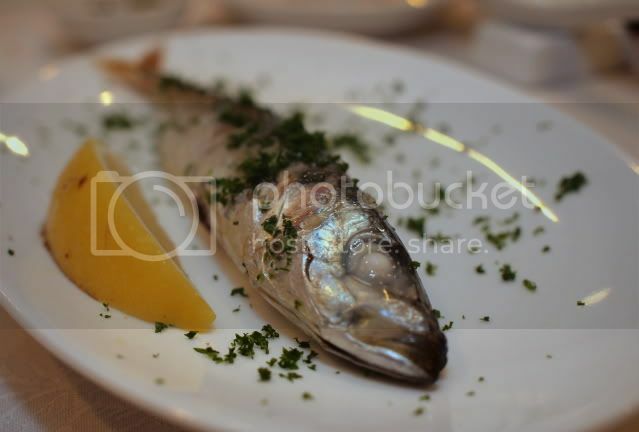 Pomfrets are one of my favourite sea fish, so I was rather happy to have this dish. 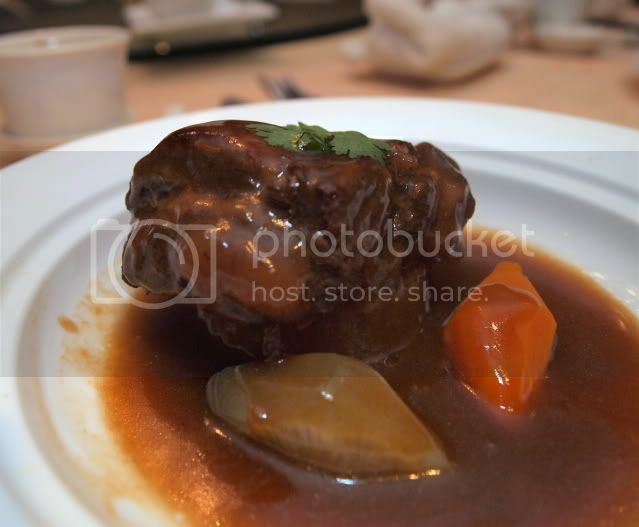 It was steamed perfectly, not overcooked, as is prone to happen at larger banquets. 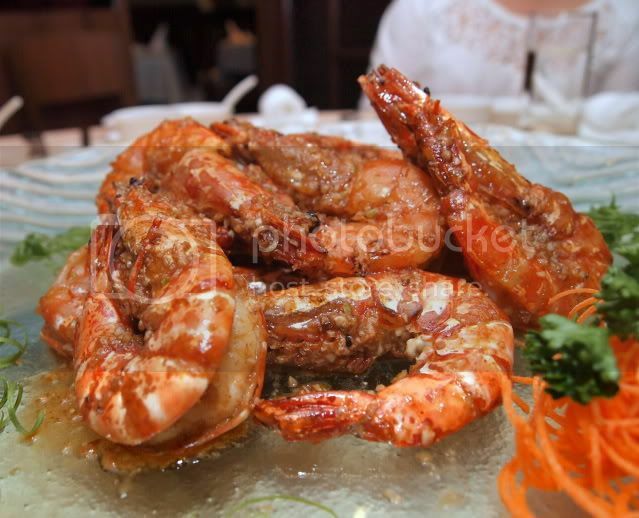 Stir Fried Tiger Prawns Vietnamese Style. 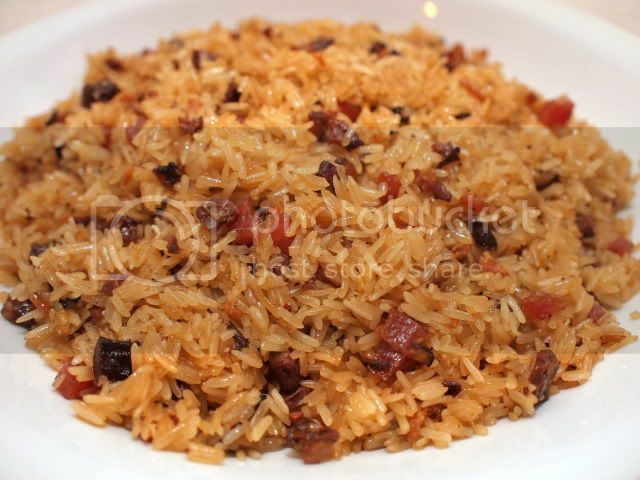 The tangy sweet sauce is actually a perfect accompaniment for white rice. 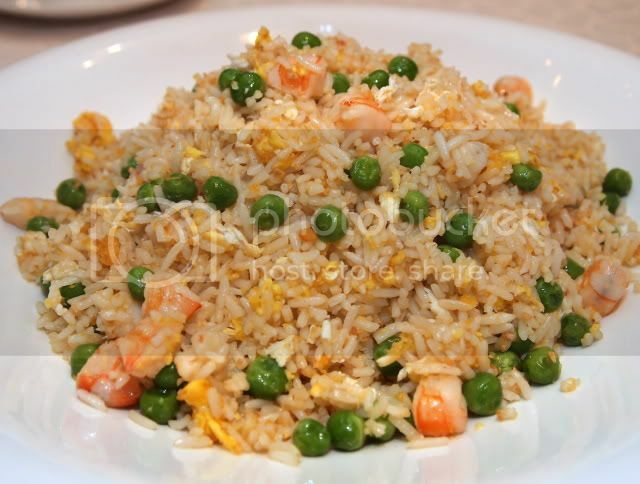 Fried Rice With Salted Egg and Diced Prawns. 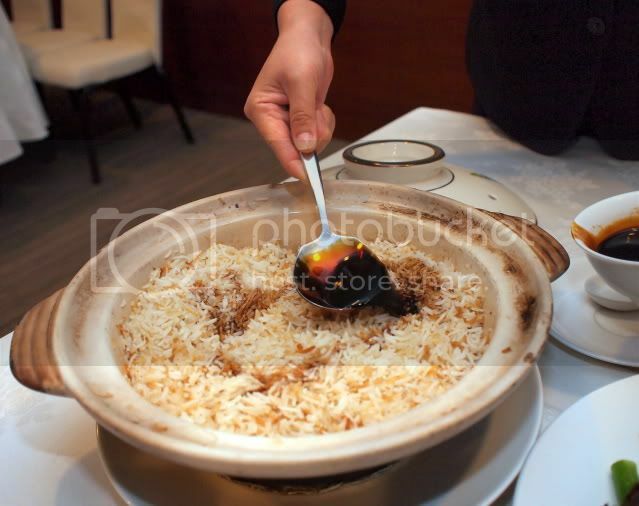 I wouldn't have minded some meat in the rice, but the salted egg, especially when you bite into the bits of yolk, does add a nice touch to the dish. 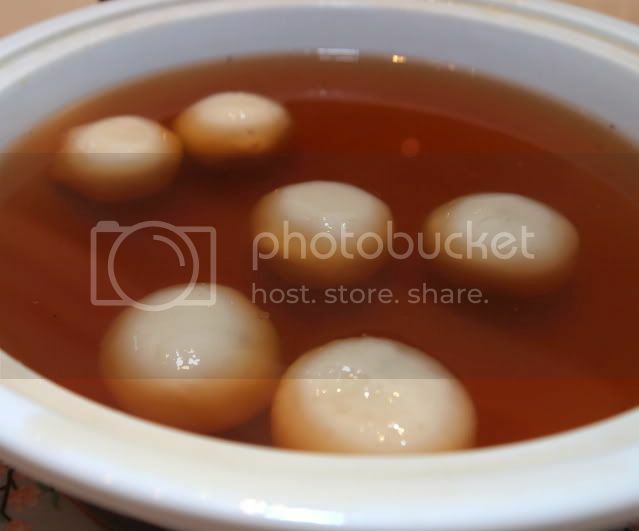 For desserts, glutinous dumplings (more like Tong Yuen served at the winter solstice) with ginger tea, (ah, the ginger tea was lovely. A bit searing at first gulp, but sends shivers of warmth to the body, and ginger expels wind). and pan fried nian gou with cheese. Cheese did I say? Well, to the cheese averse, it's a very subtle taste, and if it was not mentioned, only the VERY discerning could've picked it up. 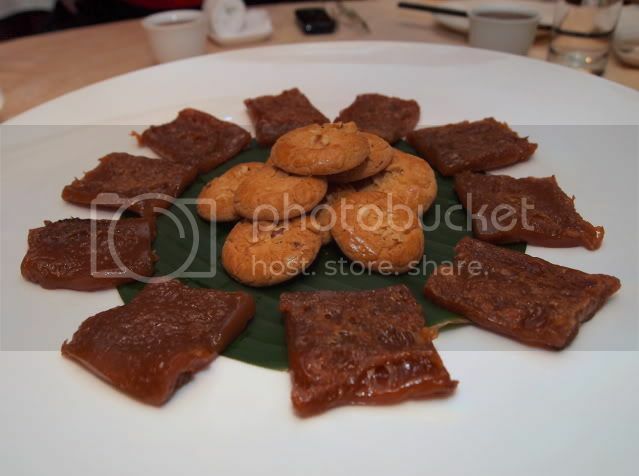 It lends a nice salty flavour to the sweet nian gao. 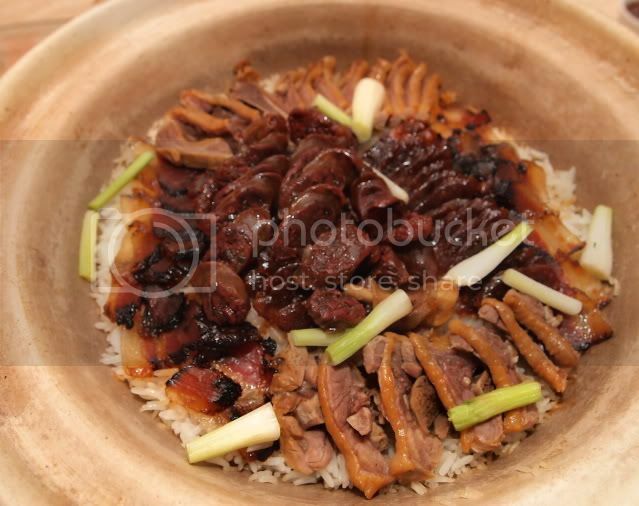 The menu above is the EARTH DRAGON Menu, and is RM1538++ per table of ten, and comes with a Chinese Tea Set. (as in, the crockery). Oh, the menu also includes a soup, which we skipped at lunch time. What kind of soup? Well, give them a call to find out. 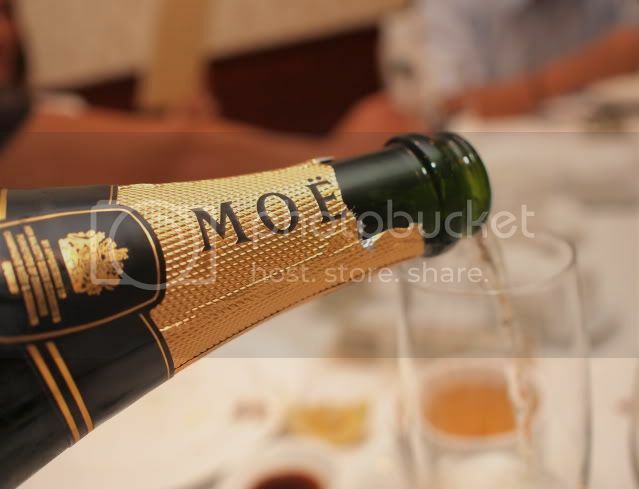 There is also the Celestial Dragon set at 1338++ per table, and the Water Dragon at RM3838++ per table. 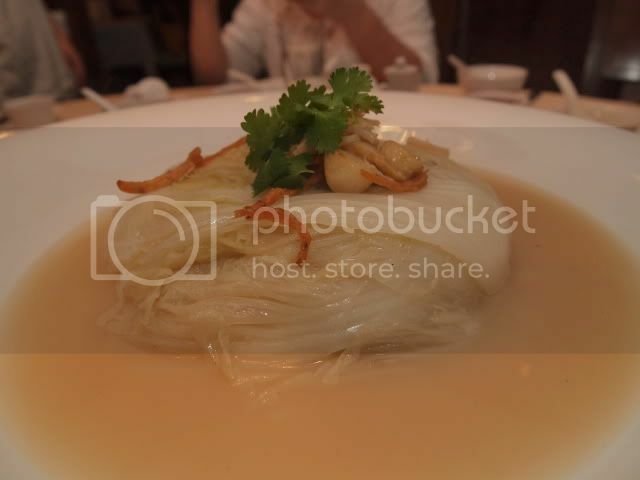 Lest you keel over, it does come with abalone, lobster and all the other expensive Chinese delicacies. Thanks to Carol of Equatorial for a lovely lunch. Do you know that 10 minutes of reading time before an examination begins, where you're supposed to read the questions? That is like an eternity, because, it gives you an idea what lies in store, and whether or not the road ahead is going to be a struggle, or a breeze (though I have never experienced the latter)...and sometimes, the road ahead seems so insurmountable that you just want to stab yourself with the pen. Well, it might not have evoked quite the same reaction, but certainly, when I read Chef Thye Seng's menu for the night, I thought WOW, that is A LOT of food. Insurmountable! 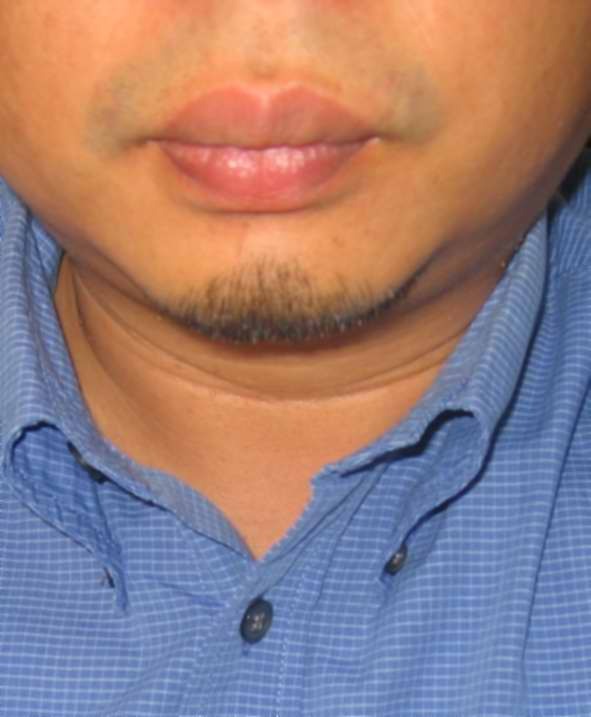 Don't worry, he assures us, the pork knuckle is a very small portion. Check out the cute lil angpow packets, picked specially from Hong Kong. Chef also made a profound remark, that the dish should be high after low. As in, after "low sang", the pile of stuff should remain high, because if the dish sinks, it means the vegetables/fruits were cut too early, and all the moisture had gone out during the toss. 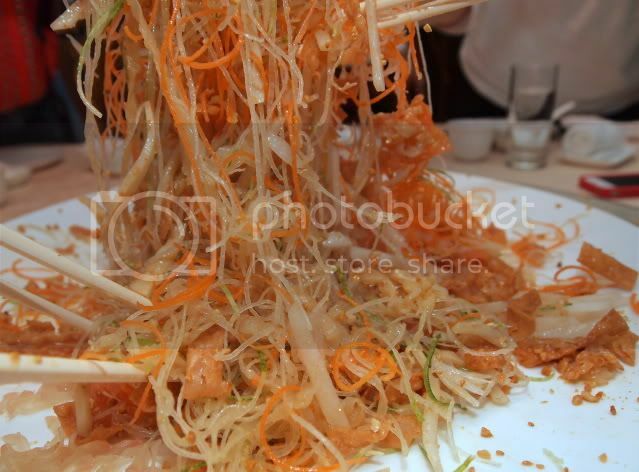 So, measure that mount of yee sang after your toss! Did I say Chef Choi has an amazing variety of cuisine? 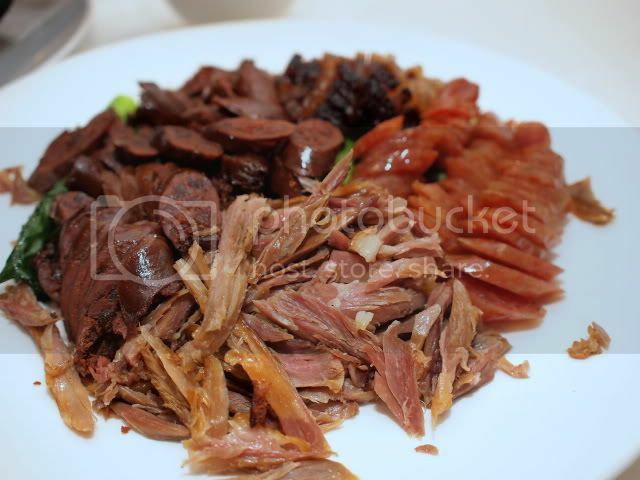 It is not JUST a Chinese restaurant. This balsamic vinegar, wonderfully aromatic, is from that high class vinegar joint at O Gourmet, (I forget what it's called). 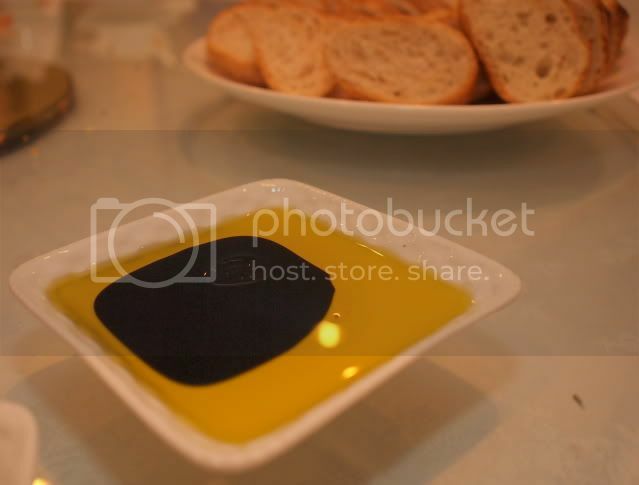 But really, looking at the menu, WHO I ask, in their right mind, would want to eat bread regardless of how delicious the bread, olive oil and vinegar is? Well, all of us succumbed. Grilled Sardine Fish, only because we were so lucky and Thye Seng had found fresh sardines in the market that morning. So don't expect it on the menu. Now, I have to admit that this is my first recollection of eating sardines that are not from a can. In fact, I wasn't even sure if Sardines referred to the method of preparation, (packed like sardines in the LRT), or the type of fish. It obviously refers to the type of fish. 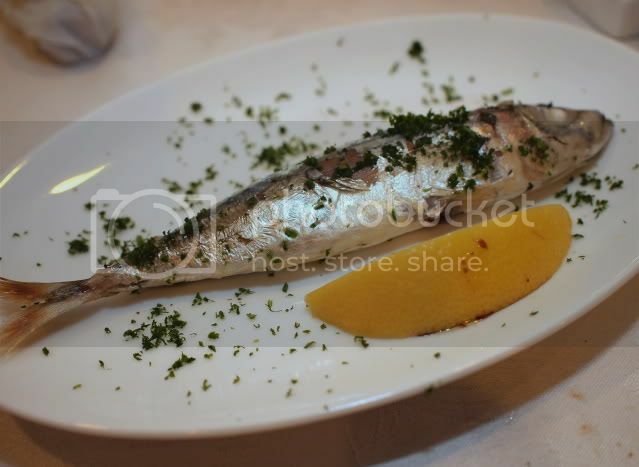 Fresh sardines are simply delicious, and simply grilled, really brings out the flavour of the fresh fish. Fish experts would know, looking at the eyeballs, that the fish is really fresh. 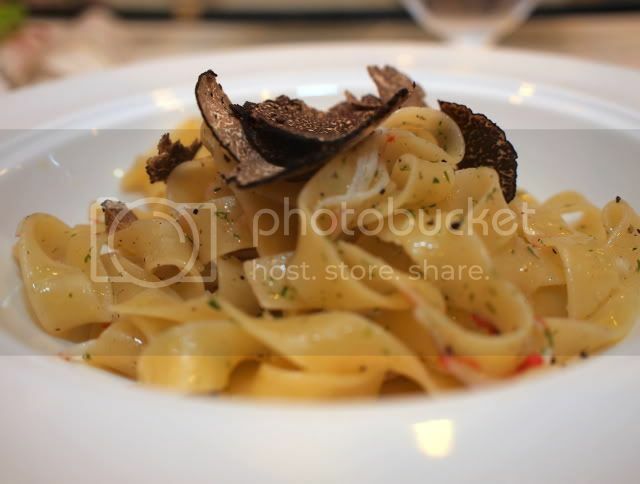 Fettucine with crab and black truffle. 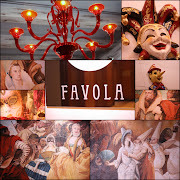 I wonder how I will ever eat ordinary fettucine again. 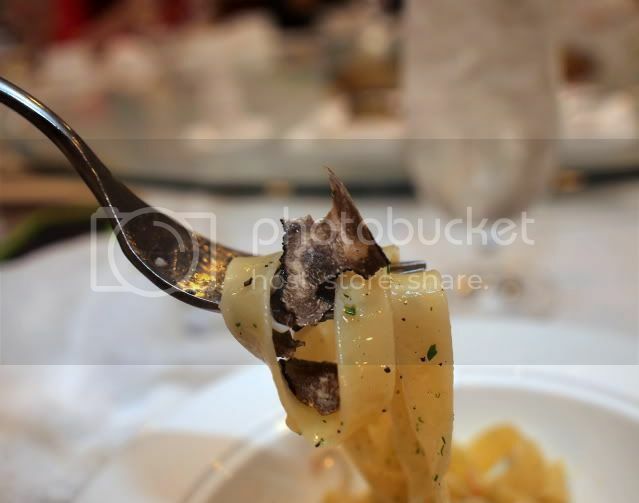 Perfect al dente, and the gloriously subtle flavour infused by the truffle really sent shivers down my tingling spine. 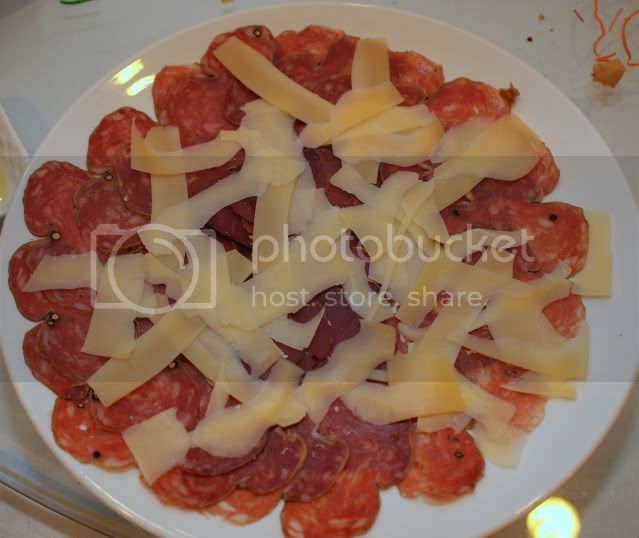 Saucisson, Pork Loin and Shaved parmesan. Home made pickled Zuchinni. Lovely way to eat Zuchinni. 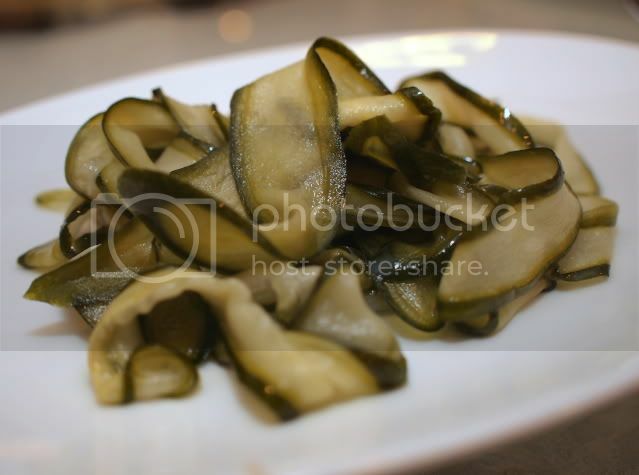 It has a lovely crunch, isn;t pickled so sour like a pickled cucumber. 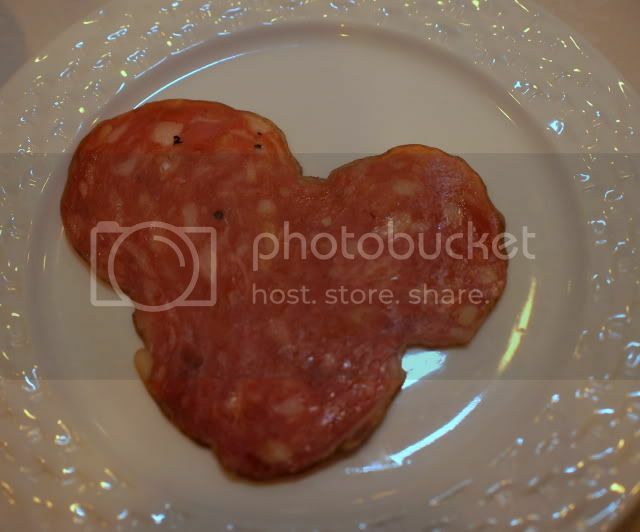 The hidden Mickey in the Saucisson. The dried cured meats are lovely, and the pork loin, though the first bite didn;t make much of an impression, really grows on you. 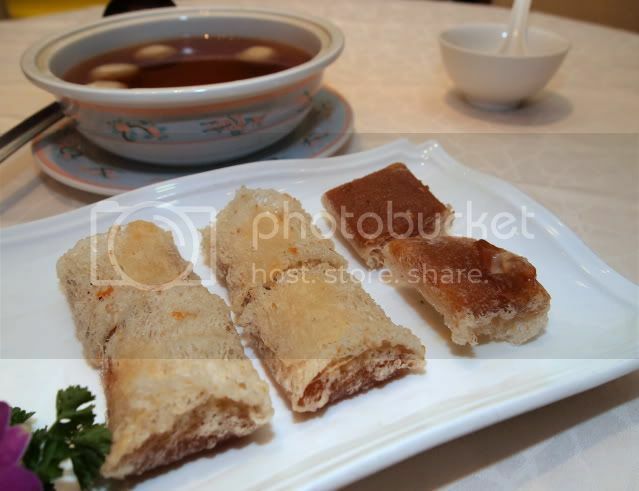 Steamed kurau with white truffle. 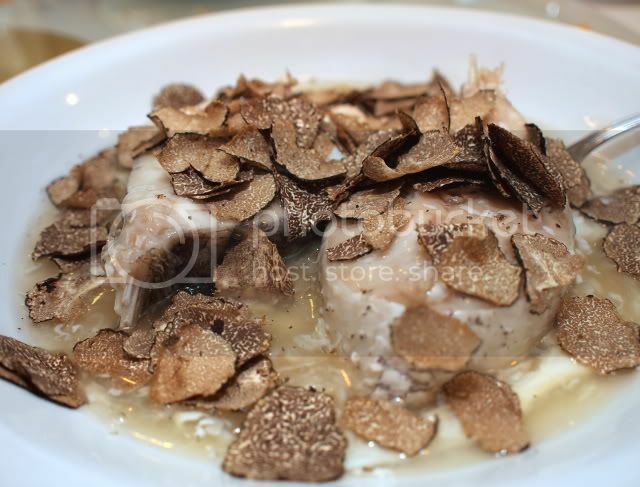 MY FAVOURITE FISH, steamed with TRUFFLE. 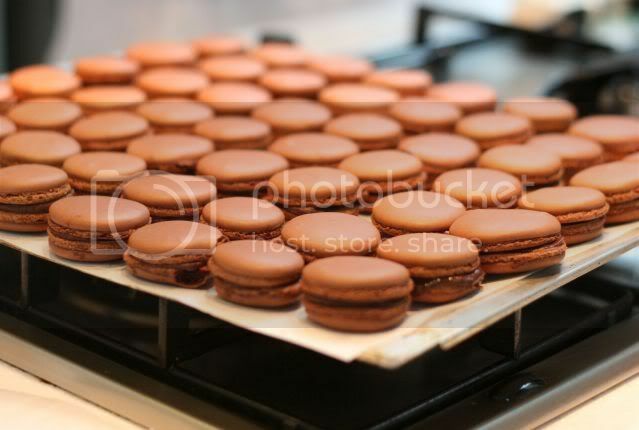 Bliss on a plate. And such fresh kurau too. I said I found it rare for any restaurant to serve kurau, though the connoiseurs on the table said it was available at a few places. 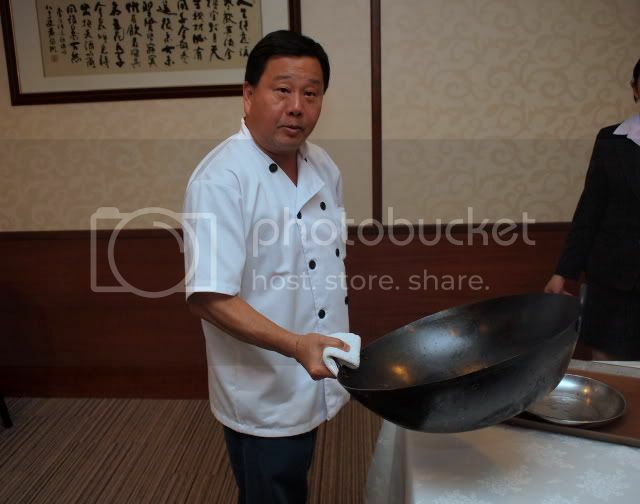 Thye Seng demonstrates how heavy an 18 inch cast iron wok is, especially if you use wrist work to toss the wok. You need one strong wrist!!! 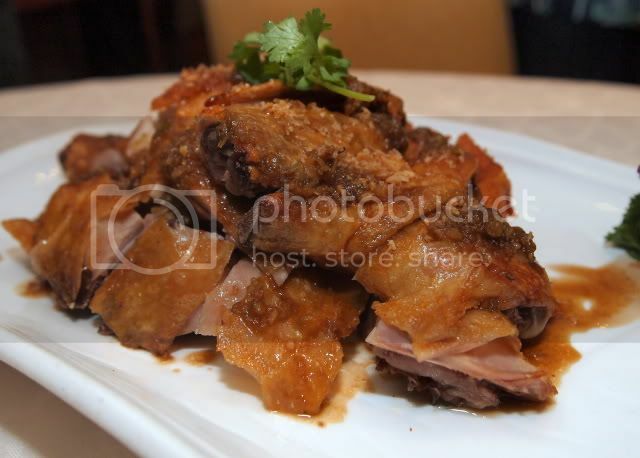 The modest sized pork knuckle (Yuen Tai), with the tender succulent meat falling off the bone. Layers of mouth watering artery clogging fat. 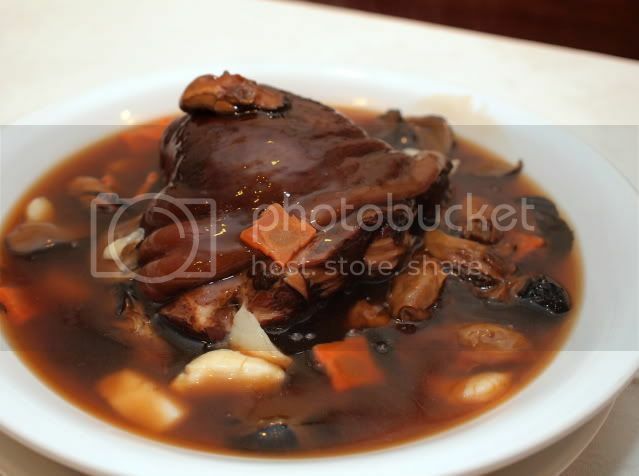 Braised Wah Wah Choy with scallops. 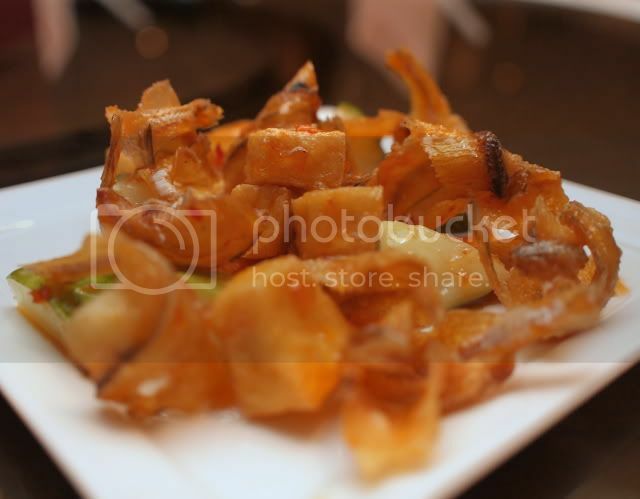 The token vegetable dish. 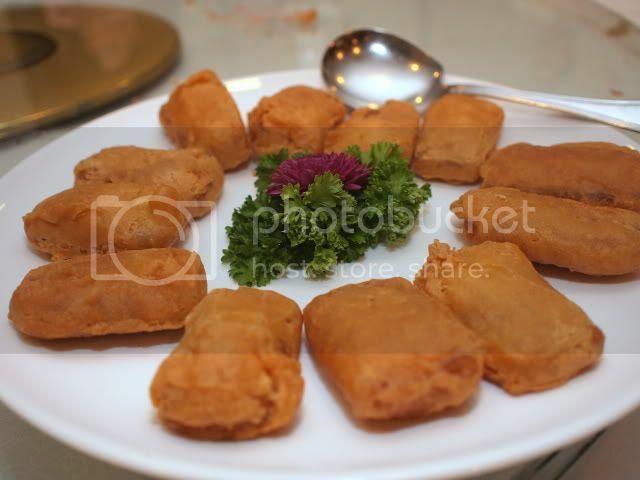 Arghhhh, such delicious fried glutinous rice. Just thinking about it makes me salivate. Seriously, so so so good. Ta-pau-ed some little leftover, and the kids whacked it in 2 minutes. And the finale, that lap mei fan that was oh so so soooo good. 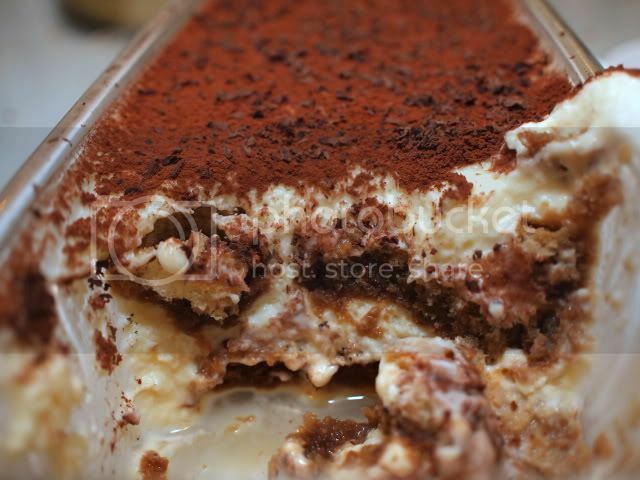 Thye Seng's special tiramisu. 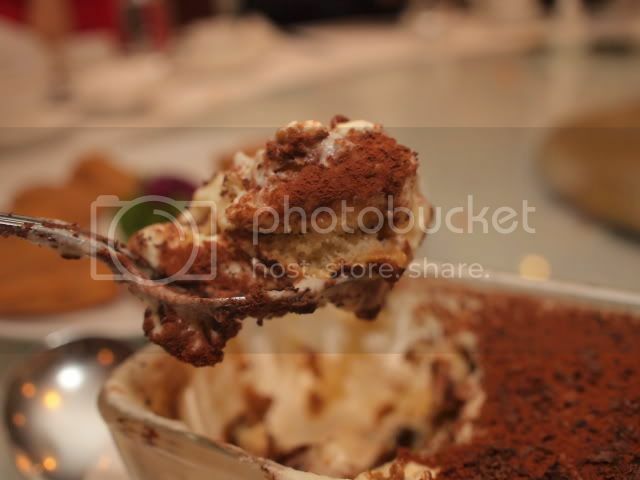 Ethereally light mascarpone with savioardi sponge fingers. Perfectly manicured nails to model that yummy nian gou. Chef Choi is another place to seriously consider if you want great food and great ambience, and easy parking, for CNY or reunion dinner. Thankie once again TS & CS for an earth shaking dinner! In a blink of an eye, almost exactly 2 years to the day, Providence smiled upon me again, when once again, Eu Hooi Khaw, that iconic food writer and makan fairy godmother, extended me an invite to once again dine at ELEGANT INN, in Menara Hap Seng. Checking out my previous post on Elegant Inn was very deja vu. Almost scary, to realise that two years had zipped by just like that. Well, the main cast look no worse for wear, the proprietess, Jeannette Han, looks younger, and that handsome young chef, looks exactly the same. (if he looked any younger he'd have to don on a white shirt and olive green pants with a school badge). 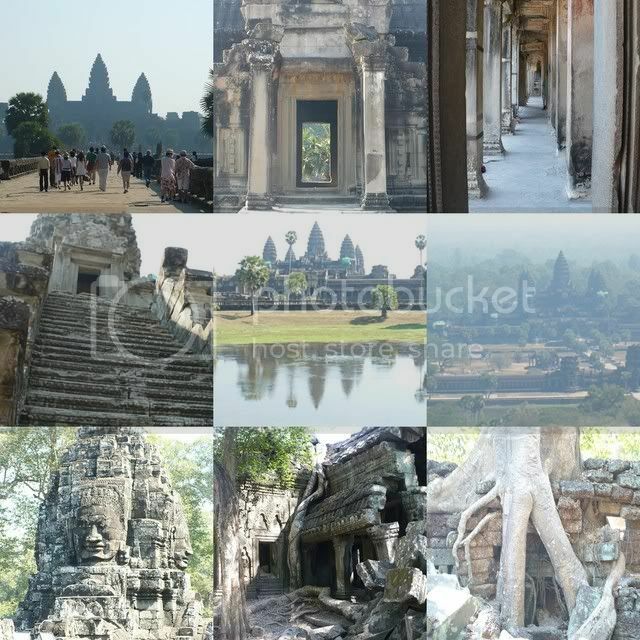 And of course, us, the guest, and Hooi Khaw, have been preserved in a time warp, and have not added a single wrinkle. 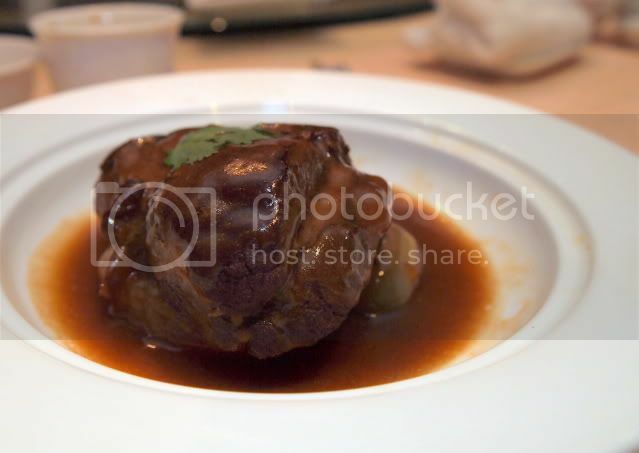 Jeannette had just gotten off the plane from an ingredient buying spree in Hong Kong, and regales us with culinary capers that make us salivate. I must have forgotten to take a picture of the peanuts, but she says there was once, the peanut supply was so inconsistent, her staff had to hand pick each nut, with a 60% rejection rate. Yes, she is THAT particular about the quality of food. 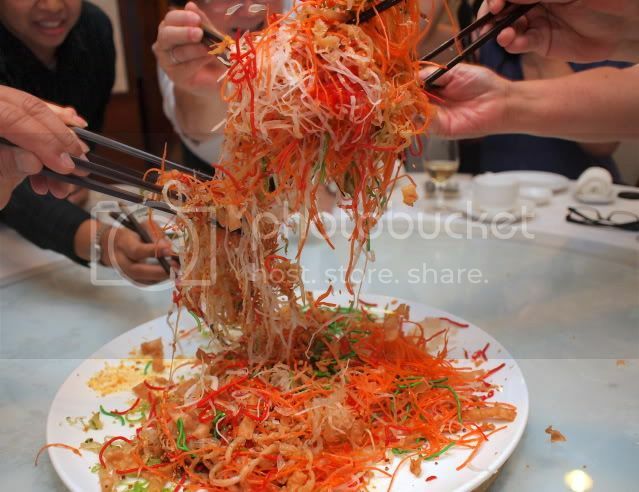 So it is no surprise that our first Yee Sang of the year was perfect. No need to have the conundrum of jelly fish, abalone or ocean trout sashimi. 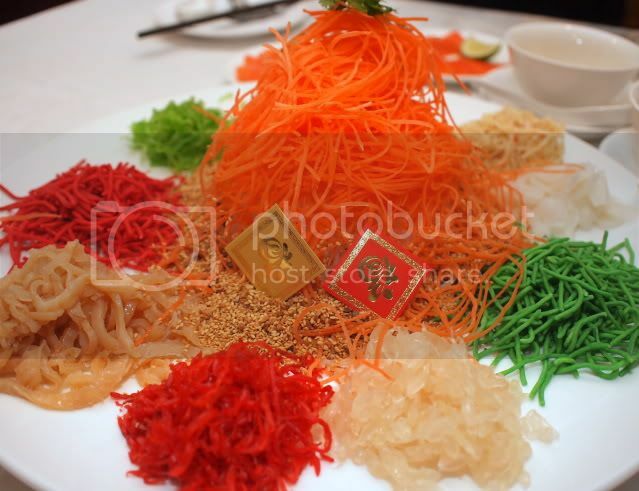 She gives us all three, explaining that the jelly fish gives the crunch, the abalone gives that marine flavour, and the fish ...well, it isn't called YEE sang for nothing. No artificially colored artificial vegetables. A high toss, encapsulating our dreams and aspirations for the coming year. Good health, good food, good fortune....good business. 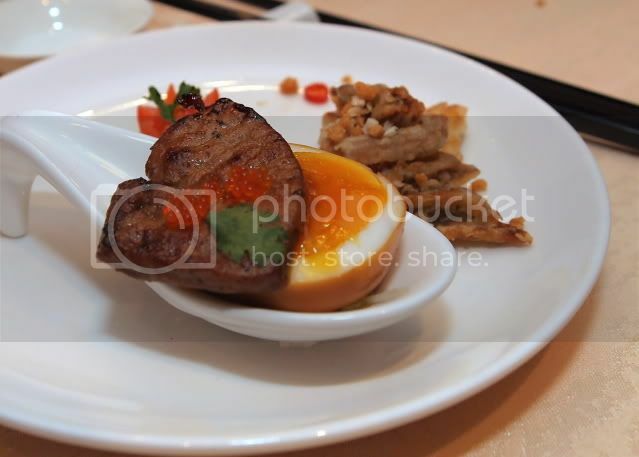 Decadence takes on the form of pan seared foie gras with eggy goodness, a double dose of cholesterol, but so worth it. 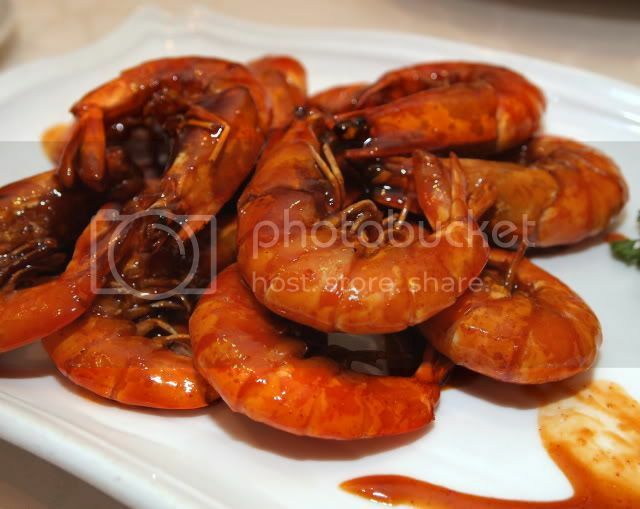 Prawns signify the sound of laughter, Siew Ha Ha....gorgeous sea prawns fried "simply" in garlic, but SO good. Oh, the theme for the night according to Jeannette was "simple". I guess it's time to redefine words in my vocabulary, for nothing struck me as simple. Chinese Sandwich. As opposed to a Gwai Lou sandwich I guess. 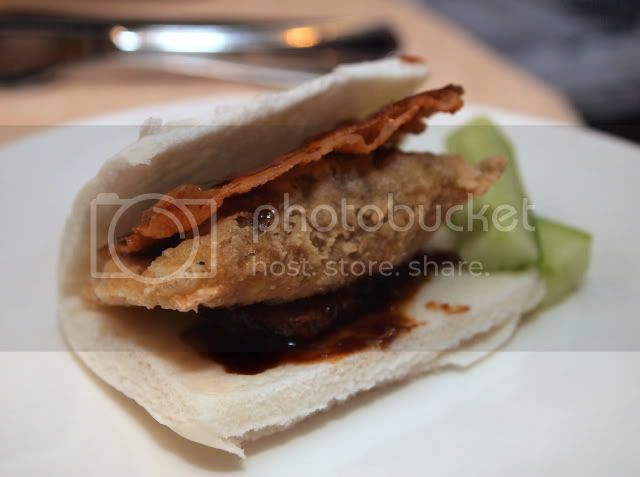 Soft mantaus wrapping a piece of deep fried chicken skin, a piece of beancurd with prawn mash and hoi sin sauce. Lovely finger food. My favourite for the night. Braised pork shoulder...actually it was a very unique cut, with bits of cartilage on, and utterly melt in the mouth, in a lovely gravy that has simmered with all the chinese new year good stuff, like oysters, etc. See, I told you everyone still looks so good. 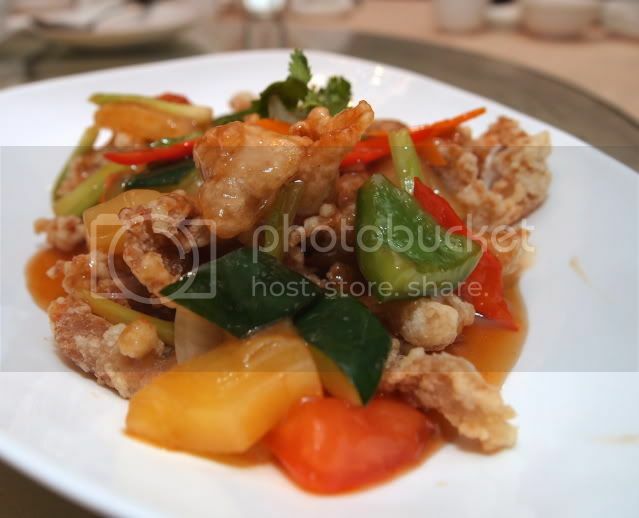 Traditional sweet and sour pork, but oh so good. I daresay this is the best non-iberico version I've ever tasted. The pork is crispy but moist, and Jeannette explains that she likes them in strips, not rolled, like some places. 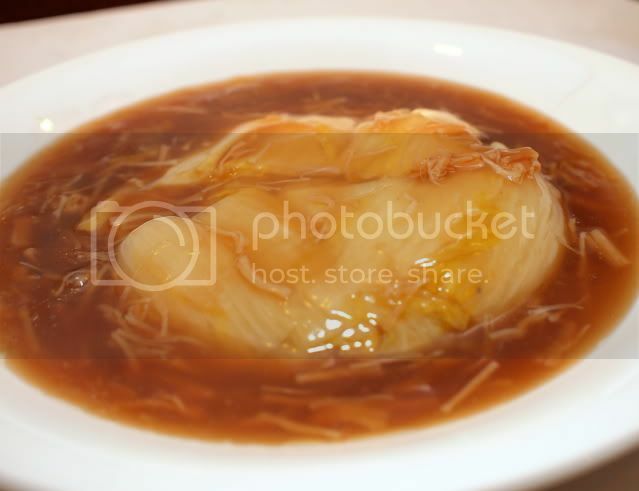 The piece de resistance, the LAP MEI FAN, that pot of sheer utter goodness and decadence, the definite herald of Chinese new year. 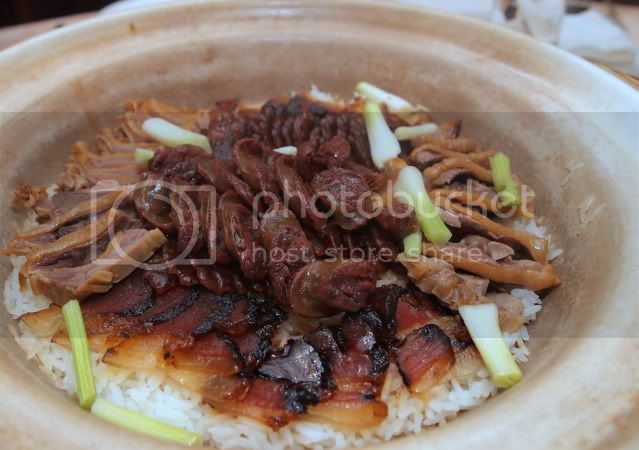 A hodge podge of waxed meats, with the juices melded into the fluffy rice. Anti Carbo Ciki abstained from the rice. The token vegetable for the night, called Wa Wa choy. 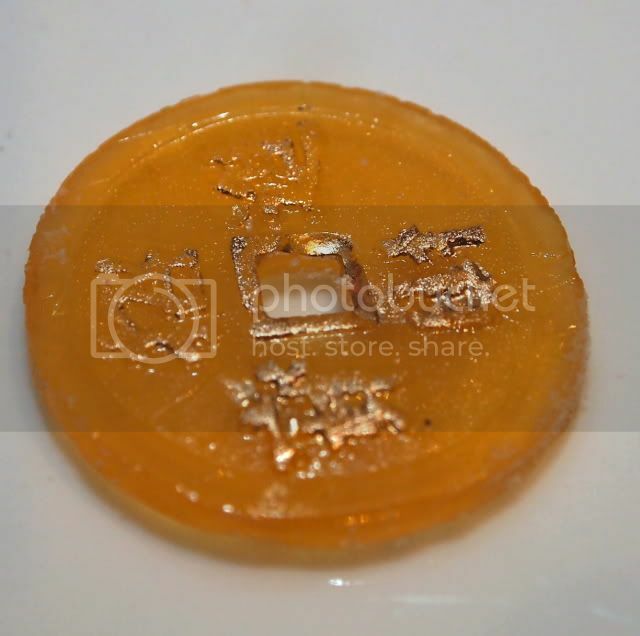 To end the fabulous meal, nian gao, from Hong Kong. Different from ours, not so sticky, and this was crispy on the outside and soft on the inside, almost dodol-ly, (which is a compliment). 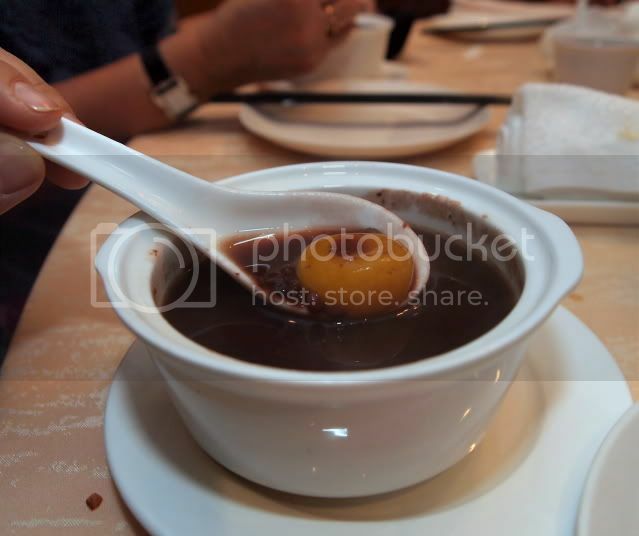 Tong Yuen in red bean paste. I love red bean paste, and this one had hints of black glutinous rice, of course sourced from the very best source, ie, the black market. 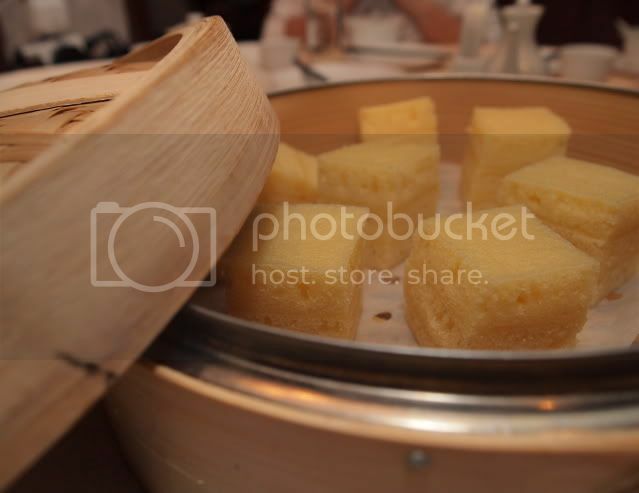 And as a special treat, Malai kou, (Malay kueh).... soft, fluffy egg based steamed cake with egg custard. Yummy. The good news is, Elegant Inn is opened throughout the Chinese New Year period. 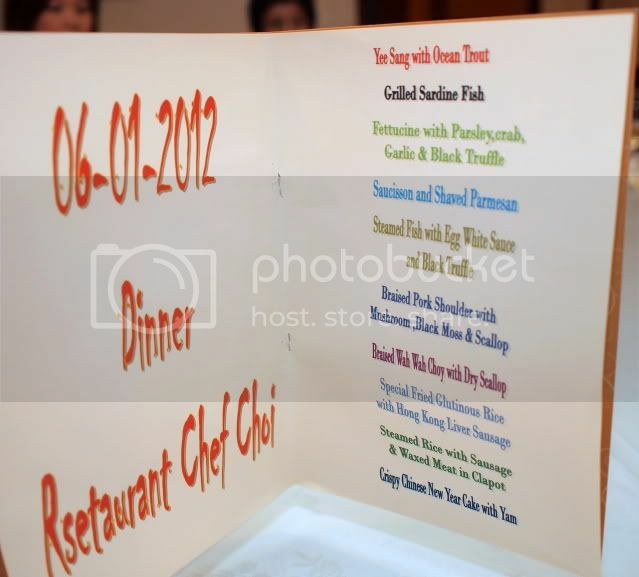 Do call them to check out the various set dinners available. A Warning though, the lap mei fan is NOT, I repeat, NOT available on New Year's Eve, ....I think that's what she said. Thanks Jeannette once again for a fantastic meal! 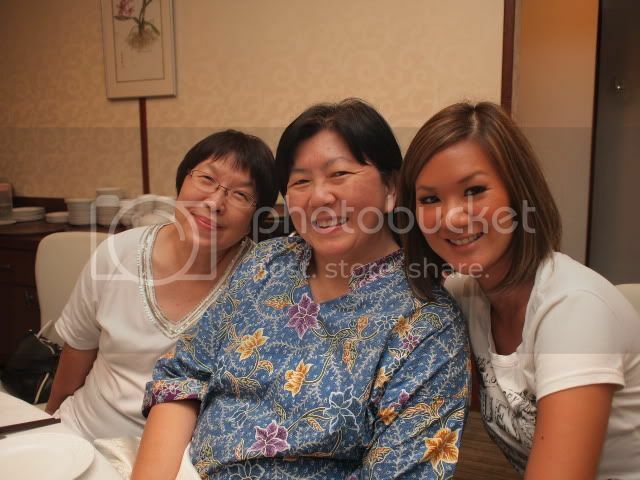 And of course to our Makan Fairy Godmother for the invite.